Throughout the year, Euclid hosts webinars on various topics, from best practices to industry trends that relate to your patients and your practice. We also participate regularly in industry conferences and trade shows. We look forward to seeing you soon. Myopia is more than a refractive condition. It’s a global epidemic that significantly increases the risk of more serious ocular health issues. What co-morbidities are associated with the disease? Why is it important to implement a Proactive Myopia Management program into your practice? Is there a simple way to get started with orthokeratology today? 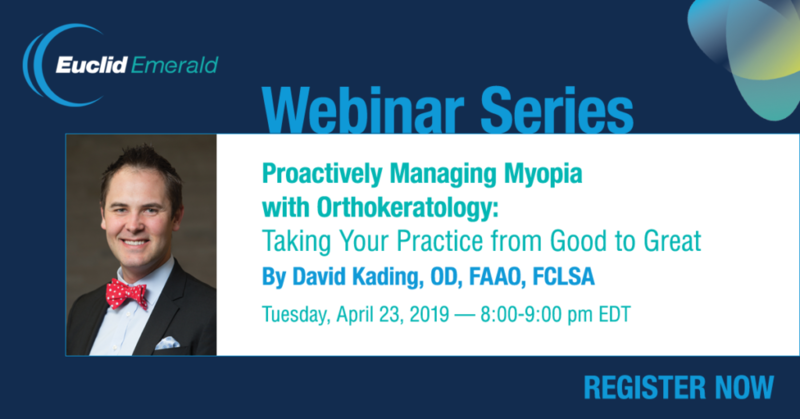 Join us for an exclusive webinar and Q&A session with Dr. David Kading to help bring your practice from Good to Great! Simply click below to register.